Here, kids practice counting up to 10 and one-to-one correspondence, improve their number recognition skills. Spring-themed worksheet explores the number 8 and provides kids with a great practice in counting numbers up to 10. 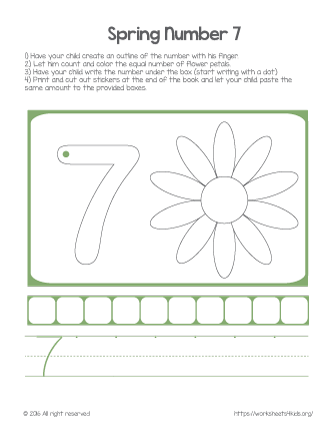 Here kids will color petals of the flower, make an outline of the number 7, glue bees, and practice writing number 7. Color six petals of the spring flower, glue six bees, make an outline of number six and practice writing number 6. 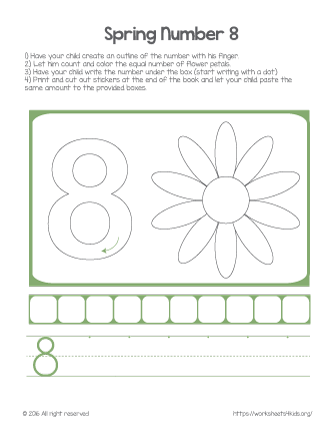 Looking for an hands-on activity to learn numbers? Here you go! 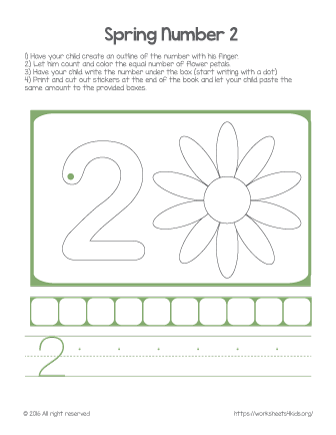 Colorful spring-themed worksheet for your little kindergartener. Create an outline of the number, color the equal number of petals, write the number and glue the same amount of flowers! Looking for fun way learning number 3 with your kindergartener? Here is a great hands-on worksheet! In this worksheet, kindergarten kids learn number 2. They will color petals, make the outline, and more! Let your child dive into numbers and start learning number 1. This spring-themed math worksheet will engage your child. With this worksheet, kindergarten students will solve four scrambles and write the uncovered words underneath. Have your child look at each box and build the word. Direct him to write the word in the provided area underneath the box. 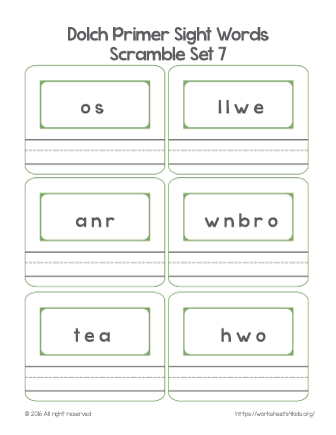 Sight word scrambles for little learners. 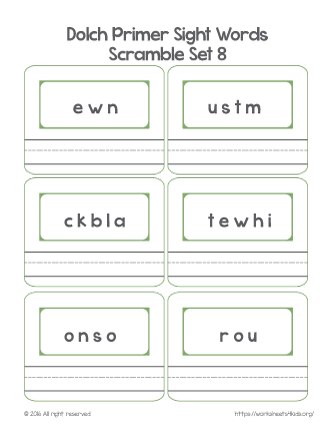 The worksheet based on Dolch primer list and includes six words.